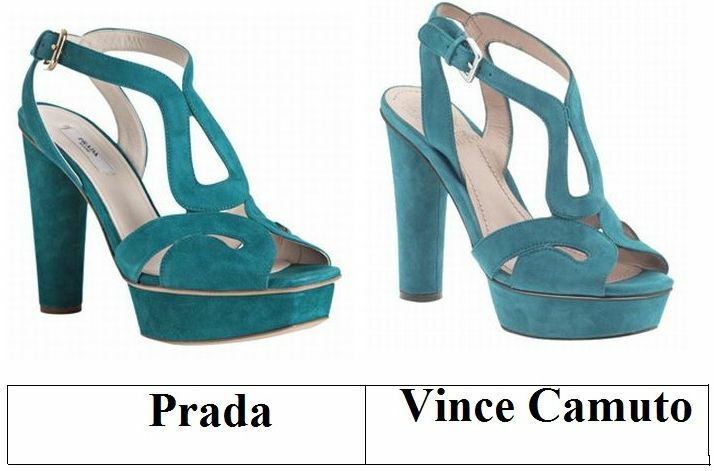 Kitty cats, representing the left corner we have Prada’s tantalizing Turquoise Suede Cutout Platform Sandals – the very same ones seen on Ms. Alexa Chung, le decadent Diane Kruger, and Harry Potter’s very own Bonnie Wright; sitting pretty in the right corner we have Vince Camuto’s tres chic Trinity in Tropic Teal Suede. Though the charming Camuto’s sport a slightly higher heel (5” as opposed to 4 ¼”) than their haute couture counterpart; for a mere $129.00, in comparison to the $795.00 required to take the pretty Prada’s home, they are every bit as fabulous as their higher priced cousins, proving that the devil doesn’t always wear Prada…sometimes she wears vibrant Vince Camuto’s! Thanks to Bluefly and Piperlime for the pictures. I'm so glad you found this deal. Wow, so love the color. So lovely. I like the cheaper priced one..too. I think I'll go for Camuto! But I am a total sucker for Prada shoes... am going to have to (theoretically, of course) splurge on this one! girl...you always find the best knock-offs! i.want.this.shoe. It's a gorgeous colour for a shoe and I love the slightly chunky heel. I'm lusting over the Prada one. Love the Vince Camutos! I like the higher heel with the lower price! And they look almost identical!! i like the shape of the vince camuto's better, great find!! Definitely the thrifty pair. Love the color! These would be wonderful with black opaque tights for a holiday party. I LOVE them! Seriously?!! Wow!! I can't tell them apart. I'll save a few hundred bucks here and go with the "save"!! The colour is like wow! I would take the Vince Camuto version though. Heels are higher and its cheaper. Whoa, amazing match there! I'd be cool with the Vince Camuto's, actually! My kind of shoe. And I like the cheaper version just as much. Wow such an exact same look! Gorgeous sandals, honey ! Like them both! Well, of course, save! These are adorable, and such a deal! Thanks for sharing. In love with the color!!! I LOVE the color of the Prada pair, so I just have to splurge. They're amazing! I love them both. What great colors! Those vince camuto's are such a great copy--I wonder what would happen if you dyed them a little darker--exact match, no? Soooo adorable! These are ADORABLE! I love the Camutos -- what a great color. the vince camutos are practically the same thing, minus hundreds of dollars! IF the more Xpensive shoes last much longer & are more comfortable, then paying the Xtra is tempting! I have to say... they look practically the same. I would see no need to splurge in this case at all.